Fiction – Kindle edition; Atlantic Books; 176 pages; 2012. 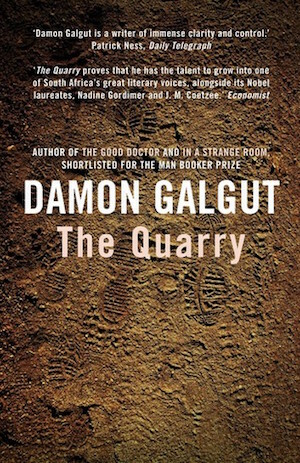 Last year, having read the extraordinarily good In a Strange Room (which made my top 10 favourite reads of 2017), I decided that Damon Galgut was now one of my favourite authors. I had previously read The Good Doctor and very much enjoyed it. Now it was time to explore more of his backlist. The Quarry, first published in South Africa in 1995, is a novella in which a man on the run from the law switches identity with the priest he murders. It is a brilliant depiction of horror, suspense and murder using beautiful pared back language and an evocative South African landscape as the setting. He saw the mountains recede like a bite-mark on the sky and then a charred plain replaced them. The man climbed out of the dam and went on. When he had gone for a way he stopped and he saw the policeman come to the dam too and climb in. He experienced again the taste of the water because he knew that the other man was drinking. He sat down on the ground and waited. When the policeman climbed back out of the dam he got up again and went on. He was no longer sure that there was a difference between them or that they were separate from each other and they moved on together across the surface of the world and the sun went down and it got dark and still they continued in duet. They moved through the night in faintest silhouette like dreams that the soil was having. The chapters are exceedingly short (there are 56 of them) but they are filled with so much suspense and drama, it doesn’t take long to race through the entire 176 pages. I read it in two short sittings. It’s difficult to say much more, because the joy (for want of a better word) of reading this book is being carried along for the ride and not knowing what is going to happen next. It’s not a conventional story by any stretch of the imagination and the dubious morality of the characters makes the reader feel complicit in their crimes. But this is not a crime novel (as I have seen it described) but a compelling chase novel where danger and violence lurk around every corner. Beastings by Benjamin Myer: a dystopian-like chase novel across the wet and wild landscapes of northern England. It’s a really quick read, Lisa. I completed it in two 40 minute train journeys. I also really liked In a Strange Room. I hadn’t heard of this one, so I’ll take a look at it. After I read In a Strange Room last year I went and bought his entire back catalogue… such a brilliant writer. I’m not sure how he creates such atmospheres/moods by using such few words, his prose is so stripped back. I have a gloriously tacky hardcover 1st edition of this book that I bought in Cape Town. It’s the only one of his books I haven’t read and I’ve been saving it so I had one to look forward to. But he is at work on anew novel now so perhaps it’s time to read it. Oh, I bet that 1st edition is nicer than the ultra-cheap Kindle version I bought! Do read it… be interested to know what you think. It’s a super quick read and very dark / morally challenging in places. A very enticing review and one that I do happen to have on my tbr. You have just sorted my next read. I also enjoy this author having previously read The Good Doctor and In A Strange Room. Ah, Jen, pull it from the pile and give it a read… it’ll only take an hour or two. I didn’t know what to expect when I first began reading it and was pleasantly surprised… the storyline is shocking but he writes so beautifully that it’s hard not to be completely drawn in. The excerpt you chose reminds of those chases where the two sit down together for a break and a bite to eat, then get up again and resume their roles. It is actually a bit like that… there’s a lot of dancing around each other. I’ve seen you (and others) recommend Damon Galgut before, but your description of this book really intrigues me. If I remember correctly, I was also interested in Beastings (was that one on your Best of 2017 list?). Yes, Beastings was on my best of 2017 list… I really liked the Gothic feel of it. This Galgut has a similar feel: it could be set at any time, so you’re never sure if it’s past, present or maybe dystopian.